My sister Alice and I bought a bicycle for $10 and painted it delphinium blue. She was 15. I was 10. 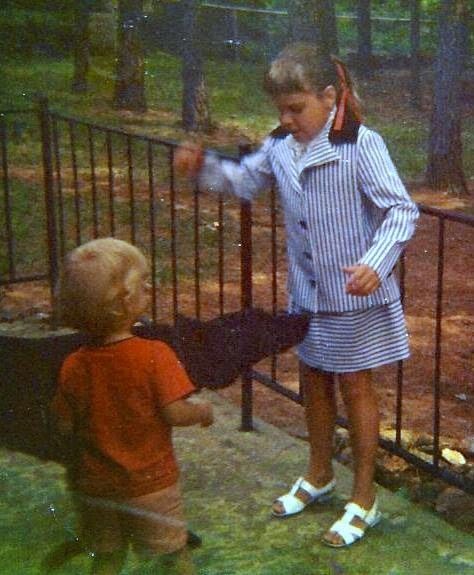 After it was dry and we were standing in the back yard admiring it, Mom decided she wanted to try it out, so she got on and rode it right into the side of the neighbor's garage. She limped for a couple of days, but the bicycle was okay. We tried unsuccessfully not to laugh, and she didn't try to ride our bicycle again. Like mine, Wayne's first bicycle was a second-hand bike they bought from the neighbors. He said he didn't really like it because the handlebars weren't what he wanted, so he turned them around. When he was a teenager, he and two friends were doing a 14-mile bicycle ride for a Boy Scout badge. (Wayne was going for eagle scout until he discovered girls.) After about ten miles his chain broke, but his friend pulled him with the broken chain. It twisted, he fell off his bike and broke his wrist -- bone sticking out -- Clyde. He said the mayor happened to drive by and took him in to the doctor. Only in Highland, Illinois would it be the mayor who picked him up and took him to the doctor. Small towns are like that -- Mayberry, USA. Before we get to the bicycles, you have to know that Amy wanted to drive anything with wheels. I wish I had a picture of the car she made out of plywood. She took it on suicide hill and the car succumbed to the hill's wishes. Luckily Amy didn't get hurt. 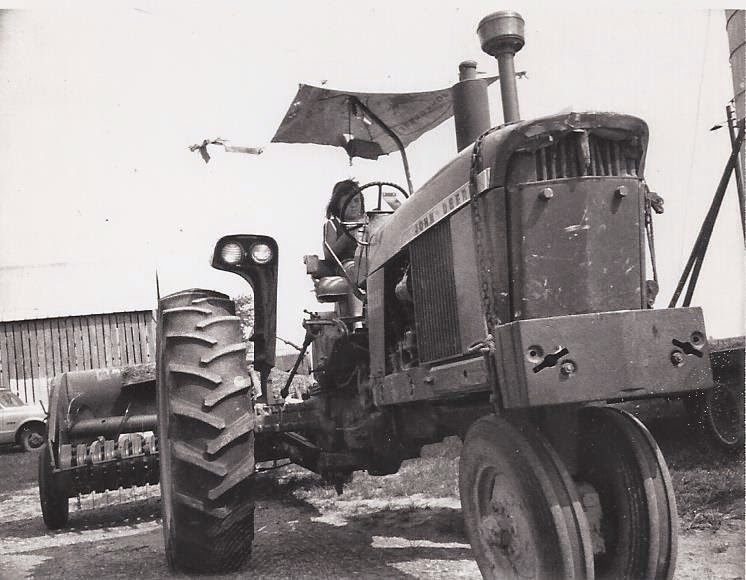 Then there was this picture of Amy on Uncle Ben's tractor. One year when Amy was about eight, it was the Listers' turn for our yearly Thanksgiving get-together. Fortunately or unfortunately, depending on your point of view, Mark had a new moped. After much discussion (because we thought Amy was too young) Mark was kind enough to let her ride it, so my stomach was doing flipflops while she rode around, and then she drove it right up a tree. Nobody hurt. Poor Mark. I don't think the moped suffered. 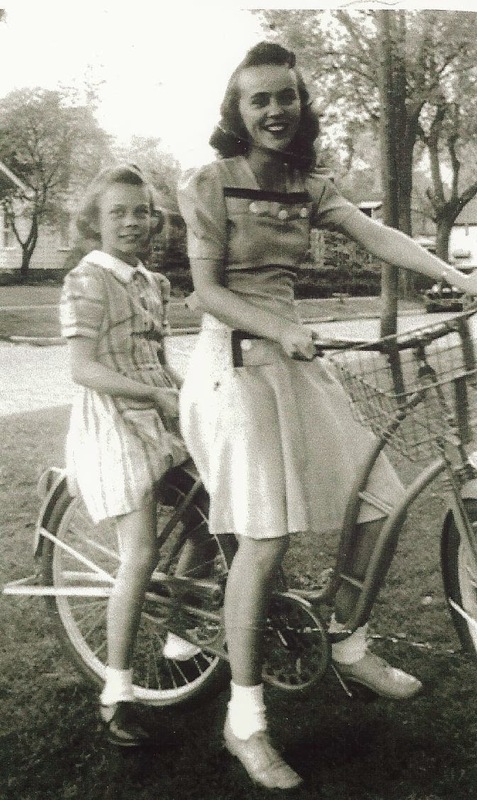 Amy wanted a Raleigh ten-speed bicycle for Christmas when she was about ten. We convinced her we had to wait until her birthday in February. But, we lied. We parked a red Raleigh ten-speed and Wes's big wheel behind the Christmas tree, outside on the deck. When she found it, she was so happy she buried her head in the sofa crying. That bike had more miles on it than our car. 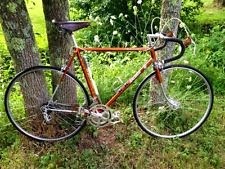 The guy at the S&K Bike Shop said it was in there for repairs and new tires more than any other bike he serviced. I can't believe I don't have at least one picture of her on her bike. She probably moved too fast. Wes had many bicycles after the Big-wheel. 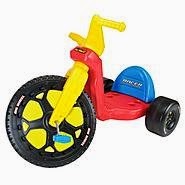 His first we got at Sears, but the next one was a goldenrod Mongoose dirt bike, whatever that is, Tripper model! He rode his bicycle to school when he didn't ride the bus. 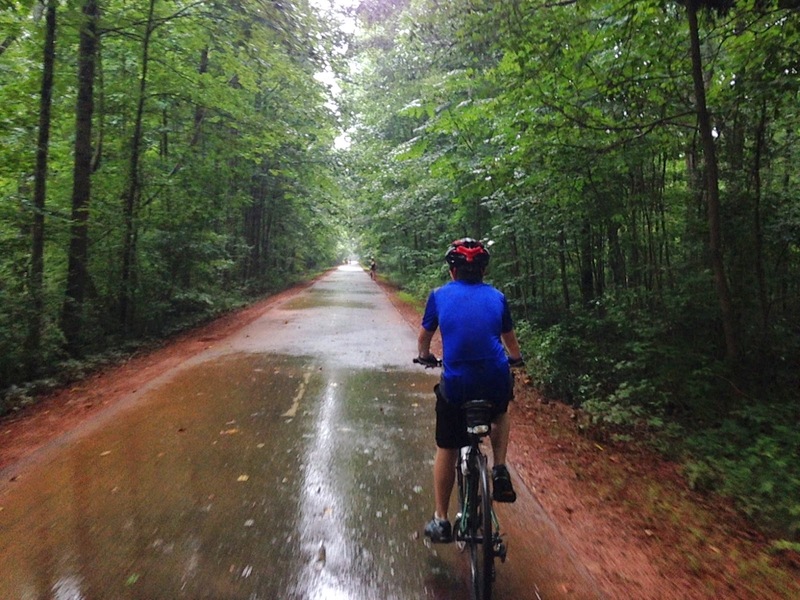 The route he took to avoid a long uphill ride took him to a street that led into Forest Road. Many years later he told me he never looked to see if a car was coming. Some kind of test or dare to himself? I'm glad I didn't know that. Or maybe he just wanted some momentum to get up the hill in front of our house. Around junior or senior year in high school, maybe between, Amy and some friends wanted to go to the beach. After negotiations took place, Robyn, Julie, and Amy and I went to Jekyll and rented a condo(?) for a few days. I stayed upstairs and read and gave them the first floor. I can still see Julie sitting under the open stairway fixing her hair. I don't remember much of what we did except eat, play on the beach, and rent mopeds. At about midnight, I had to play Rapunzel without hair, and convince them from the second floor window that -- No, they were not going riding on mopeds in the middle of the night. I wonder if they would tell this story differently. 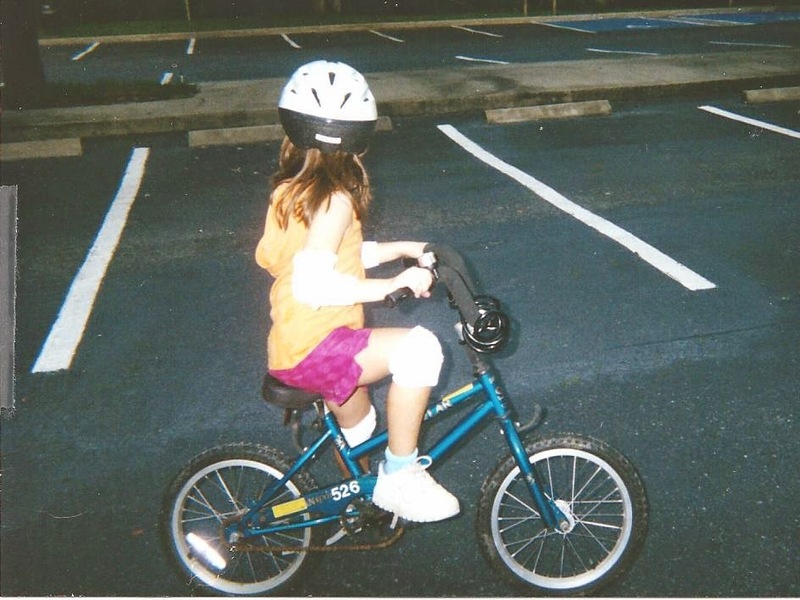 Emma was about seven years old and couldn't ride a bicycle without training wheels. Amy and I decided to take her to Jekyll with us on one of our mini-vacations (big concession, usually no kids allowed) and teach her to ride in one of those big parking lots. Then she could enjoy the bike path with us. We had brought her helmet and bike and we rented some for us. don't have any knee pads and I'll fall down and hurt my elbows." I love Emma so much that tears come to my eyes sometimes, but she can really be a pain in the you know what. I cut up two pairs of my nice new vacation socks. You can see them on her elbows and knees. We wore her down and she learned to ride, but not before she ran into a white van -- only car in the parking lot. There were lots of scratches on it already, so we couldn't find any damage, but she stood there, arms crossed, saying, "See, I told you I couldn't ride a bicycle." She did learn to ride and was very proud of herself, but I don't remember if we took the ride on the bike path. We might have been too worn out, so she probably rode around and around the parking lot. Classy girl, Emma! Charlie took right off, so there's no story there. Now he's riding the big bikes. I love this picture. Bam is right behind him manning the camera. Another Jekyll story for Amy and me, without kids. 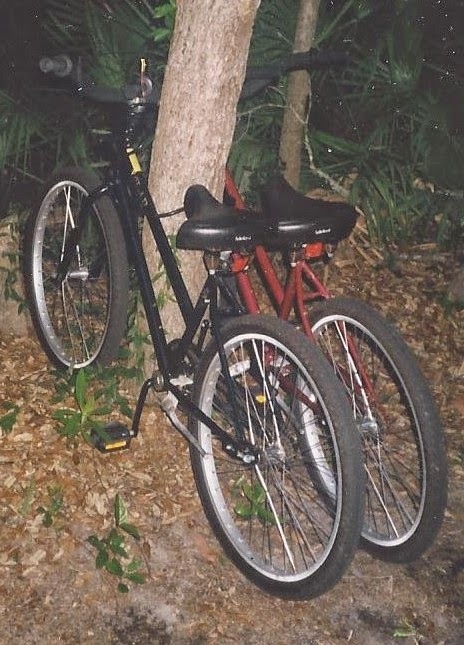 We had so much fun we took a picture of our bicycles. It was not without incident, however. I'm short (Yeah, well your momma wears army shoes!) so there wasn't a bike that could be adjusted for me, but they had a girl's bike, so once I got on, it was okay. Amy and I were in the parking lot talking. Oh, how I wish she could be here. She would probably remember why we were standing in the middle of the parking lot with our bicycles -- or maybe not. and while we were talking, I was half sitting and half balancing myself on my toes. That's the part that was unstable. I said to Amy, "Amy, I'm going to fall over." So I did. Scraped my knee and my elbow, because I didn't have sock-pads on. I was very embarrassed, falling over while standing still, so Amy spent the rest of the day concocting a story to explain my injuries. She was trying to make a heroine of me. I was rescuing children on the beach or something, but all I remember of her story is this line, "Along came an earthquake."